While the marine search for Sir John Franklin's lost ships has come up dry so far this summer, land-based sites have yielded a bonanza of artifacts that could help shed further light on what happened after the vessels were abandoned in the Arctic. Archeologists Doug Stenton and Bob Park discovered everything from human bones and a tooth to nails, buttons and tiny scraps of cloth as they carefully scoured several Franklin artifact sites on King William Island in Nunavut. “These sites have been identified before, but it's fascinating and very exciting that there's still quite a bit of material available to study," says Park, a professor and archeological anthropologist at the University of Waterloo. "The bigger pieces have gone, but there's a lot of small stuff. "Attraction to this area seemed to come after the Franklin crew were dead but what they left behind was of interest and use to Inuit who occupied the area. What they took and what was of use to them — iron and hardwood for example — is really interesting as well." Most of the officers and crew of the 1845 Franklin expedition met their demise on King William Island after abandoning their ships Terror and Erebus, which were stuck in ice in Victoria Strait, just west of the island. Stenton, director of heritage for the Government of Nunavut, and Park have known each other since their graduate school days at University of Alberta in the 1980s. They have worked as a team searching Franklin sites in the North since 2008. 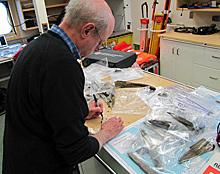 In their most recent search, they flew by helicopter from the Canadian Coast Guard icebreaker Sir Wilfrid Laurier and carefully examined site NgLg-3, one of two established Franklin sites near Erebus Bay, on the west side of King William Island. It is a harsh and difficult environment that would have been particularly unforgiving for Franklin's crew. “Nothing can exceed the gloom and desolation of the western coast of King William Island,” wrote Capt. Francis McClintock, as he searched for the missing expedition in 1860. Although Stenton and Park did their work in the sunshine, it’s not hard to imagine how formidable this landscape was to the expedition crew stranded there for more than two years. “This is the place where some human remains were found in 1992,” Parks says, while looking around the stoney site. At the site officially known as NgLj-3, artifacts were scattered about. Some were readily visible, such as broken pieces of wood. Others were not easily seen by the untrained eye. All of them were left behind by sailors who found themselves in a dire and dangerous predicament. None of the 129 men aboard Franklin's ships survived, making it the worst marine exploration tragedy in British history. While few details are known about their fate, one 19th-century search party did discover a boat and sled that had been hauled by Franklin's men at Erebus Bay. The area came to be known as the Boat Place, and the artifacts found there this year could be from that boat or sled. “There are copper rivets and nails, and iron washers that came from a ship's boat that was about 28 feet long, and/or from a sled that would carry the boat,” Park says. For some of the archeological work, Stenton turned to a metal detector, running it over over stones and tundra moss while listening carefully in his headphones. 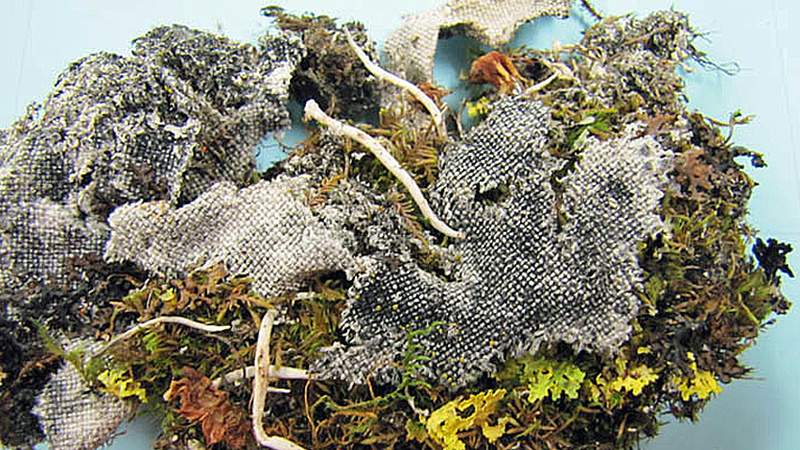 The detector led him to a copper nail, green with oxidation in the tundra moss. Stenton says there are a lot more copper nails than iron nails in the area, and that the fragments of wood scattered around are evidence that the Inuit broke apart wood to extract the iron nails. It is not known why they preferred iron to copper. Stenton thinks that it may be because copper is less maleable and more fragile, especially in the Arctic cold. Stenton says a number of Franklin's men died at the Boat Place. Skeletal remains and "a lot of artifacts" have been found there. Bones found there this year include a human scapula and vertebra. They were added to bones in a stone cairn on the site. Neither Park nor Stenton take human bones from artifact sites in order to preserve human dignity. Park and Stenton have found important artifacts this year — a brass button with "Portsmouth” engraved on it, pieces of cloth and a bone-handled toothbrush, for example. "These items connect you with the people who were there, and maybe reflect a bit on what took place here," Stenton says. Back in their lab on the Laurier, Stenton organized and labelled and put the finds in plastic bags.